Sorry, guys, we are going to skip the next installment of the Innkeeper. Nothing is wrong, the mammogram was normal – thank you to everyone who emailed – it’s just that we are working full speed on Hugh to finish in time for our deadline and because we are in the finale, it’s very hard to switch gears at this point. We have an action-packed scene coming up for Maud, and we want to do it justice. So we will see you next week. But we do have a consolation bribe available for you this Friday. Click here to read the first two chapters of Magic Triumphs. Please keep in mind that the chapters haven’t been through the copyedit and will contain grammatical mistakes. They will be replaced with cleaned up versions once the book has been properly edited. Also, it is a massively long excerpt, so please be patient with the page load. And now i’ve Taken the time to actually read it, and it’s wowzer! And nobody else has commented. I feel like you made a special Friday treat just for me. Thank you again. Glad to hear the mammogram was good. Blessings. Thank you. We understand that you are busy and that you take time out of it to give us the Friday treat. That was really great of you to share Kate’s excerpt. Great bribe! I’ve now got it on pre-order with Amazon. Love, love, LOVE(!) the Friday gifts you give to us. This storyline is outstanding and Helen is a joy. I’ve got a space reserved on my library shelves for when the final version is published. Thank you so much. Bribe snatched and gratefully accepted. Can’t imagine how you are able to switch gears the way you do. Love following where your imagination leads! Magic Triumphs …. after that teaser, definitely must also do a pre-order. It’s like Kate’s World never left my brain! I immersed myself as if I’d just finished Magic Binds!! Thank you so much for my Friday treat! I am so excited to see Maud turn house Krahr on it’s ear bwahahahah. I was really looking forward to the next inkeeper and was surprised that it was about Maud and Arland. Awesome! Thank You from the bottom of my heart for what you do. Wonderful bribe, fully accepted and appreciated!! Bribe very gratefully accepted. Loved it!!! Was very spooked by whatever it was that had Derek’s tummy turning inside out! Now have to pre-order to make sure I get my copy asap. Thank you most gracious Authorlords for your many gifts to BDH. I was so happy your chi-chi squish turned out negative. Thank the Creator our prayers were answered. Blessings . I have this one pre-ordered (is it August yet?) and I’ve bookmarked the bribe for my own special treat. For after I’ve dealt with my own book-related (well, translation-related) deadline. Thank you for shifting my focus, and reminding me that there is another series that I really enjoy. Not many books grab and hold my attention, and the majority that I read are just something to read until the next “Magic” or “Innkeeper “ book comes out. You have provided an escape in airport terminals, long flights and the perfect slow down at the end of my day. Now if I could claim my expenditures on books as therapeutic stress reducers…..Oh well, glad to have another “Magic” soon. Missing this next instalment, but greatfull for the Kate excerpt!! Love your work and will eagerly wait for more. I’m awfully sad to be deprived of innkeeper, but I will accept your bribe. Can’t wait for more Kate and more everything and you probably don’t need much sleep just please keep writing! Ahhhh! You can’t do this to me! You give me a preview and I get sucked in and then it stops! Oh why did it have to stop!!! Loooveeee Kate!!! Thanks, Thanks , thanks for this lil gift!!! Can’t wait for more!! More of The inn and Kate!! I have just read the Kate Daniels series in order from the start, and started in on the Innkeeper books. I came to your site to find out when Magic Triumphs is to be published, and found you had posted the first two chapters! What a wonderful treat! Missed the bribe until we returned home on Wednesday and did not get to post until now. Glad I have had it on pre order since Jan. Can hardly wait until it is out. Love both the Kate series and the Innkeeper but like others the Innkeeper is what keeps me haunting your site. 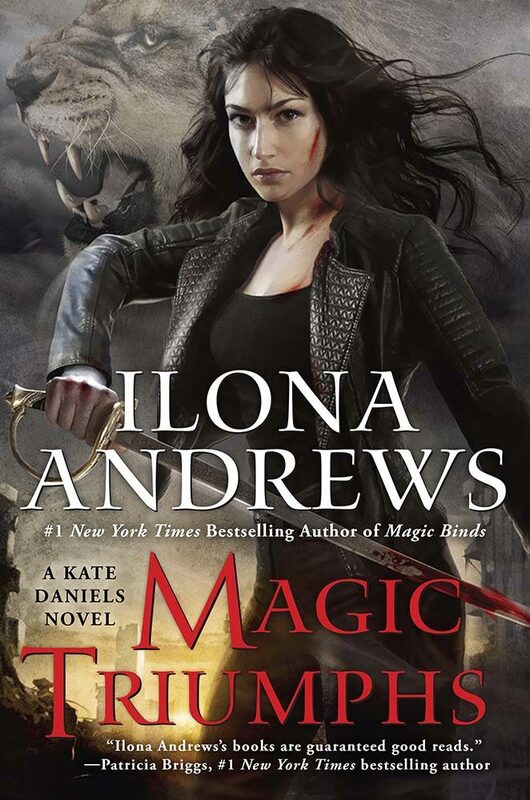 I’ve been enjoying the heck out of the Innkeeper stories – and my wife has gotten hooked on the Magic books. I only just discovered this one and have been speeding through it, but wanted to offer thanks for your sharing this and for making her happy, too! I have recent!y joined the throng of Innkeeper fans. Your skill for building believable fantasy is on par with my favorite author Anne McCaffrey, may she rest in peace. This is my fourth read through but I still hunger for more.